Kimmi's Dairyland: Celebrate New Year's Eve...with cheese? Celebrate New Year's Eve...with cheese? When you think of New Year's Eve, what first comes to mind? Is it the ball dropping in Times Square? Getting together with friends and family? Fireworks (check out the ones at the Space Needle in Seattle...awesome!)? Or do you think about cheese? Cheese? Now what does that have to do with New Year's Eve? Besides for the fact that I hope you find a way to somehow incorporate your favorite dairy products like milk, cheese and yogurt into your festivities (the cows definitely thank you! ), it has everything to do with ending one year and starting another for a town in the state nicknamed "America's Dairyland". 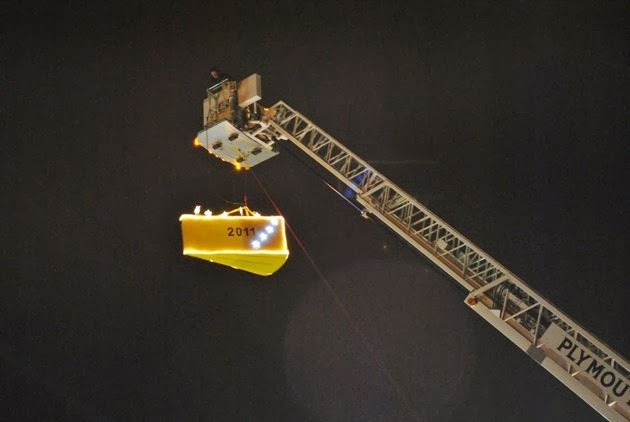 In Plymouth, Wisconsin, residents gather in the usual freezing temperatures not to watch a ball drop, but rather an 80-pound wedge of cheese lowered from a 100-foot ladder. Boring? Not at all! Now, I'm hoping these folks bring some cows or something to the celebration to really bring this full circle. But, since I won't be venturing to Wisconsin this New Year's Eve, I'll rely on those of you that do to tell me all about it. Turns out that watching the cheese drop isn't the only quirky way to ring in the new year. I found an entire list of interesting New Year's Eve traditions taking place in cities across the United States. Don't forget to add "eat more dairy products," "visit cows at the fair or a farm" or "meet a dairy farmer" to your list of New Year's Resolutions. Some farms are open to the public during the fall for agritourism (i.e. with corn mazes, pumpkin patches, etc.) and for pre-planned tours throughout the year. I'd recommend calling ahead since farmers are busy if you'd like to see the farm. 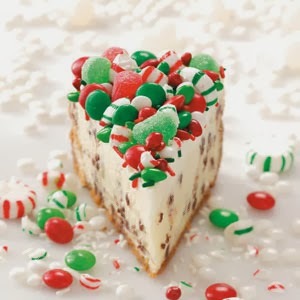 While searching the internet for festive dairy recipes, I came across this delicious-looking cheesecake from the Taste of Home. The photo has red and green candies, but feel free to substitute whichever color you'd like as you ring in 2014.